I got an email from Good Old Games advertising a well-beloved old Sierra game of mine, Gabriel Knight: Sins of the Fathers. I’ve played all the way through this game several times and have even read the novelization, so a little reminder is as much coaxing I need to give this gem another play-through. This game, as much as any other Sierra game, deserves to be explored thoroughly and slowly. Every line of dialogue yearns to be heard; every object and cranny begs to be inspected. No less important, the wonderful soundtrack deserves to be orchestrated with the finest clarity one can bestow. 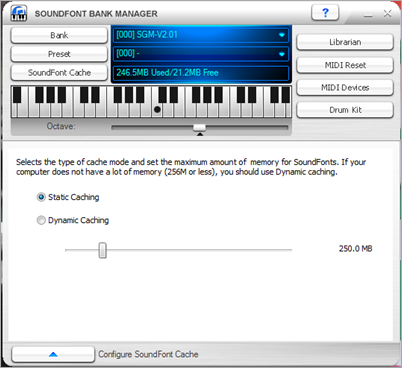 That’s why I set out to look for a nice soundfont – a bank of MIDI instruments of a higher quality than the paltry one that comes with Windows 7. The nicest I’ve found so far, with the best compatibility for DOS games, is this General MIDI soundfont by David Shan. It’s about 250MB unzipped and likely requires a fancier soundcard than an onboard Realtek. My Creative X-Fi Titanium does the trick nicely. Unfortunately, getting this sucker installed and applied was no easy task. 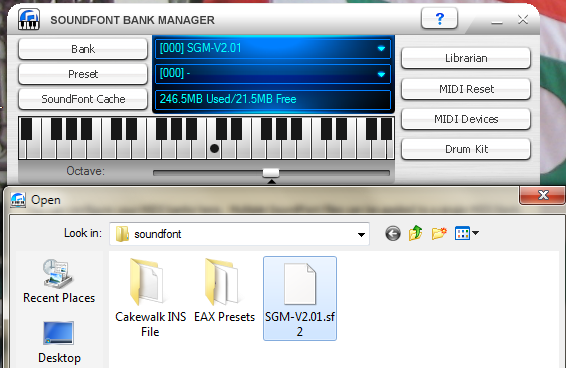 After first downloading the above soundfont to a permanent location on my hard drive, I downloaded and installed the Creative Soundfont Bank Manager (which probably only works on Creative sound cards). I then increased the cache to 250MB and changed the mode to static since I have 4GB of RAM to play with. I then clicked the Bank button, navigated to the soundfont file, and applied. Using the virtual piano in the application I immediately heard the improved sounds of the new soundfont. Unfortunately I couldn’t get the new soundfont to work in Windows, as was evidenced by my attempts to play MIDI files in Windows Media Player. My reference song, chosen for its instruments and its overall cheesiness, is All That She Wants by Ace of Base. It seems Microsoft, in all its wisdom, removed the MIDI Mapper from Windows versions Vista and up. The MIDI Mapper was the application that allowed you to choose which device you wanted to play MIDI songs with. 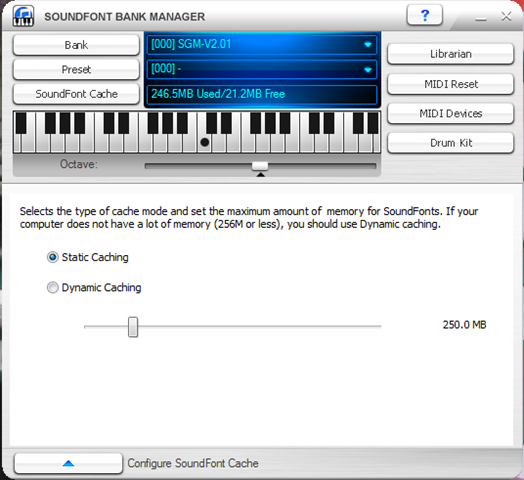 I couldn’t find this option in the Creative Soundfont Bank Manager, nor anywhere else in Windows 7. A few Bing searches directed me to this page which appeared to host the precise solution I was looking for: a Windows Control Panel module that mimicked the old MIDI Mapper. Here’s an alternative download for the Putzlowitschs Vista-MIDIMapper utility, hosted on my server, in case the original goes down. This is a binary file which seems to work for me, but I can’t attest to whether it is a secure or safe file. I saved this file to my desktop and double-clicked it which brought up the window you see in the screenshot below. The Gabriel Knight soundtrack never sounded so good. The unfortunate side-effect is that the sharp music stands in stark contrast with the decidedly low-fi voiceover recordings. Thx, this actually helped me a lot. Very glad to have helped, especially for someone with such a unique and cool blog!